11849 ESS GUINEA (1966) Water cycle*. UNESCO emblem*. 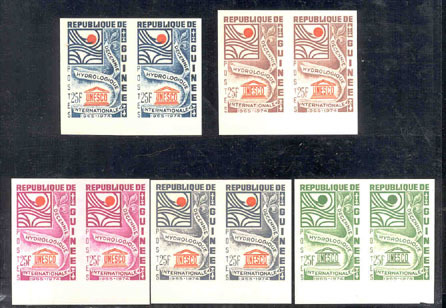 Set of 5 trial color proofs of the 25 Fr value, in colors different from the final stamp. All but one have the UNESCO emblem and orange dot, but the last has it in green! Symbolic watercycle, issue was for the Decade of International Hydrology. Scott No 434, Yvert No 285. Scarce!